Couples aspiring to holiness may not be perfect, “but they try each day to be the best they can be for one another,” says John Bosio. His new book, “Blessed Is Marriage,” suggests that holiness need not be foreign to couples simply because they find married life challenging. Bosio is a family life educator and former marriage and family therapist. Many undoubtedly recall his 2008 book, “Happy Together: The Catholic Blueprint for a Loving Marriage” (Twenty-Third Publications). 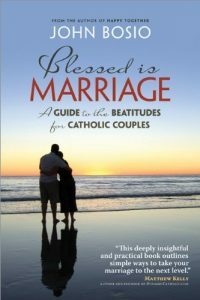 Chapter by chapter, “Blessed Is Marriage” analyzes the meaning of the Beatitudes and their implications for marriage. “Poverty in spirit, mourning, meekness, mercifulness, purity in heart, peacefulness and righteousness are the loving attitudes that open our heart to God and to one another,” Bosio writes. In their titles, the book’s chapters pair one of the Beatitudes with an insight that helps readers focus on the essentials of marriage. You might say that the chapter titles “translate” the Beatitudes for contemporary readers. Bosio holds readers’ attention in “Blessed Is Marriage” with the true stories he tells about couples who experienced struggles in marriage and who sometimes needed more than instincts and feelings to come to terms with events. Bosio does not want “Blessed Is Marriage” simply to be read and then put aside. He has designed it to be put to use. In fact, “reading this book can become your own private retreat at home,” he says to readers. To that end, he provides excellent sets of discussion questions at the conclusion of each chapter – one set for a couple to use at home, another set for group sessions. The discussion questions I come across in many books these days seem rather poorly conceived. But I suspect the questions Bosio formulates will be able to serve as the basis for some quite rewarding conversations. David Gibson is a longtime, now retired, member of the Catholic News Service staff.